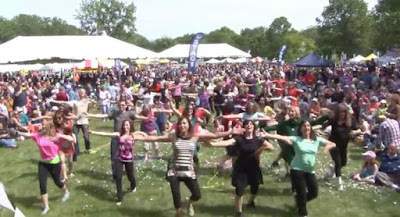 The Greater Chicago Jewish Festival is the longest running ongoing Jewish Festival in America and the largest Jewish event in the Chicago area. Created in 1980, it celebrates Jewish music, dance, art and of course food. Attracting over 20,000 people, the Festival is the heart and soul of Jewish Chicago and was last held on June 8, 2014. At the festival a group of dancers emerged in the middle of the crowd and spontaneously started a sequence of Israeli folk dances, many of which should be recognizable to our readers. Israeli folk dances are a unique phenomenon of contemporary folklore. In spite of the many changes in the values, dreams, and ways of life of the , they still dance the old dances of the 1940s and 1950s—the years during which more new dances were created than in any other culture in the world. Today there are some three thousand Israeli folk dances, according to folk-dance instructors. However, some of these dances are no longer danced. It is hard to specify which of the dances aren’t practiced but the Hora is still practiced. Many more modern dances incorporate folk inspired dance moves into their dances. Today there are groups in Israel whose jobs are to conserve the heritage of Israeli folk dance. About one hundred thousand people dance on a regular basis at least once a week and an additional one hundred thousand dance several times a year. There are regular dance groups meeting in 30 countries and more than 30 states in the USA. There is an Israeli dance website that lets you search for a group in your city and find the words to many songs in Hebrew, Yiddish, and Ladino. Looks great and dancing these songs also feels great. Shabbat Shalom. Another one that I would love to send to lots of folks-HOW????? Just click the Forward button on your email screen.